Under the dictatorships of the twentieth century, music never ceased to sound. Even when they did not impose aesthetic standards, these regimes tended to favour certain kinds of art music such as occasional works for commemorations or celebrations, symphonic poems, cantatas and choral settings. In the same way, composers who were more or less ideologically close to the regime wrote pieces of music on their own initiative, which amounted to a support of the political order. This book presents ten studies focusing on music inspired and promoted by regimes such as Nazi Germany, Fascist Italy, France under Vichy, the USSR and its satellites, Franco's Spain, Salazar's Portugal, Maoist China, and Latin-American dictatorships. By discussing the musical works themselves, whether they were conceived as ways to provide "music for the people", to personally honour the dictator, or to participate in State commemorations of glorious historical events, the book examines the relationship between the composers and the State. This important volume, therefore, addresses theoretical issues long neglected by both musicologists and historians: What is the relationship between art music and propaganda? How did composers participate in musical life under the control of an authoritarian State? What was specifically political in the works produced in these contexts? How did audiences react to them? Can we speak confidently about "State music"? 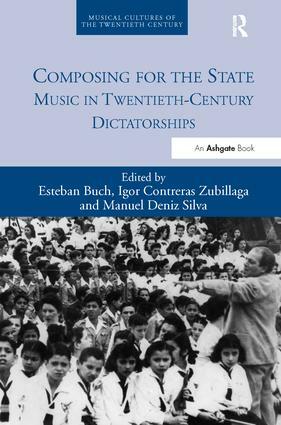 In this way, Composing for the State: Music in Twentieth Century Dictatorships is an essential contribution to our understanding of musical cultures of the twentieth century, as well as the symbolic policies of dictatorial regimes. 10. Esteban Buch Conquistadores, Indians,and Argentine Generals: Iubilum op. 51, a Commission to Alberto Ginastera (1980). Esteban Buch is directeur d’études (full professor) at the Ecole des Hautes Etudes en Sciences Sociales (EHESS) in Paris, France. A specialist of the relationships between music and politics in the twentieth century, he is the author of O juremos con gloria morir (2013), L’Affaire Bomarzo (2011), Le cas Schoenberg (2006), La Neuvième de Beethoven (1999; English tr. 2003) and Histoire d’un secret (1994). He has also co-edited Du politique en analyse musicale (2014), Tangos cultos (2012), Réévaluer l’art moderne et les avant-gardes (2010), and La Grande guerre des musiciens (2009). Igor Contreras Zubillaga is a PhD candidate at the Ecole des Hautes Etudes en Sciences Sociales of Paris, France, with a thesis on the Spanish musical avant-garde during Franco's dictatorship. He is co-editor of the volumes Le son des rouages: Representations des rapports homme-machine dans la musique du 20e siècle (2011) and A l'avant-garde! Art et politique dans les années 1960 et 1970 (2013). Manuel Deniz Silva is Research Fellow at the FCSH (Universidade Nova de Lisboa, Portugal), where he coordinates the Music and Media� thematic strand of the INET-md (Music and Dance Research Centre). He is co-editor of the Portuguese Journal of Musicology and editor of Kinethophone - Journal of Music, Sound and Moving Image. The series Musical Cultures of the Twentieth Century adopts a collaborative model for the study of key issues in twentieth-century music. The basis for each volume is a conference drawing together leading scholars from across Europe and beyond; conference themes are determined by the series’ distinguished international advisory board, with a view to developing new knowledge and understanding that reflects dialogue between scholars of different nationalities and theoretical backgrounds. Particular emphasis is placed upon recognition of the multiplicity of conceptions, artefacts, events and communities which characterised musical life in the last century. Accordingly, individual volumes seek to interrogate themes that encompass diverse musical genres and disciplinary perspectives. The series was conceived as a project of the Institute of Music of the Giorgio Cini Foundation, Venice, where many of the conferences are convened.